When I was finishing my Masters Degree, I had a theme song for my synthesis paper - Unwritten by Natasha Bedingfield. It wasn't just that it was ironic, but as I was writing my paper the line "Staring at the blank page before you; Open up the dirty window; Let the sun illuminate the words that you could not find" I saw my paper as putting down the words and thoughts that I could not find somewhere else. Today, a different line calls out to me: "Today is where your book begins. The rest is still unwritten." Well maybe not a whole new book begins but certainly a new chapter is starting and for it to begin, I must close the door on the previous one. I have been slowly, a piece at a time, been writing the last words of this chapter. Sometimes with eagerness, sometimes with anger, and sadness and certainly some trepidation as the next chapter opens with a blank page waiting to be filled. Over the last year and half, I have struggled to shed the image of myself as minister. This was not about not valuing that work, it is about needing to be seen as more than that, that my skills and experience were transferable to other professions. In addition to what I have needed professionally, I was finally free to explore Judaism. I was no longer serving a congregation, there was no one to question me about my "loyalty." When I left the Outer Banks I said that there were three things I wanted to do: explore Judaism, start a Georgetown alumni club and join a book group. So I have been working on the first two but have yet to find a book group that speaks to me. Over this year and a half I have been attending Congregation Or Ami, one of the two reform synagogues here in Richmond. I have taken two classes Introduction to Judaism and Introduction to Hebrew. I have attended the High Holy Days services for the last two years and Shabbat on a fairly regular basis. This year I also accepted a position teaching the 8th grade in the religious school. During this same time I have I had a foot in both worlds - remaining in the fellowship process within Unitarian Universalism and attending and participating at Or Ami. It is time to stop having my feet in two places. For many years now, I lived my life in the betwixt and between - not fully a minister, not solely a religious educator, identifying as a UU and attending a Reform Synagogue. There is a value to letting yourself living in the liminal spaces and at some point one steps out of it, placing oneself in one place and hence a new chapter is beginning. I have finally chosen where I want to be. This past week I officially withdrew as a candidate for ministry within Unitarian Universalism. I had already removed myself from various UU groups and pages on Facebook. Secondly, I met with Rabbi Ahuva from Or Ami and I have asked to formally join and to start the conversion process. One of the hard things I am giving up is guest preaching for UU Congregations. I will preach one last time at UU Congregation of the Rappahannock on Christmas Day. The title for the sermon is "A Jewish Family: Joseph, Mary and Jesus." I have to say realizing that I would have to give up preaching has been hard to swallow. I know when Rabbi Ahuva said that to me I felt a bit punched in the gut. As I have thought about it though it makes sense, not just because of my desire to convert but because it is time to fully close this chapter and guest preaching is part of it. I am also re-thinking about what I have here on my blog about what I do and I have taken down my wedding officiant Facebook page. All of this is about deciding where I want to be, what I want to be and to do that I can't hang on to pieces of the past that no longer fit. Yes I love preaching and the reason I love it is because for me it is about teaching. The identity that I want to shine out even brighter is that of teacher. Professionally working as an Adjunct and an instructor at Or Ami, has put new life into my working life. Maybe, just maybe I will finally find that full time job outside of a congregation that I have been searching for. Maybe I will now be seen as an educator, a person passionate about the power of education capable of teaching, coaching, directing and creating programs. That is my hope. When I first got to Richmond I remember a conversation I had with a staffing agency that I just looked like a minister and that I would want to go back there. I bristled and I have to say I have revised my resume, my cover letters, my LinkedIn profile to enhance my profile as an educator, trainer and outreach manager. It has been hard to change my brand, as they say, to be seen in new ways. In the process of this re-branding, I have come to see myself differently. I will always be a religion geek - loving ethics and theology along with the why and how of faith. I am not renouncing any part of what I have done or been, rather I am choosing to start a new chapter or maybe even it is a new book. Most profoundly I have found in Judaism the religious home I have been seeking. Here, like Jacob I can "struggle with God," whose new name Israel means "one who struggles with God." I am not asked to believe impossible things. One hallmark of Reform Judaism is the idea of informed choice. It is expected that I will learn and know the variety of ways people practice Judaism, including things like the dietary laws, and determine what practices resonate and work to deepen my life, particularly my spiritual life. I do not make this choice lightly or with haste. It has taken me a year and a half of prayer, reflection and participation at Or Ami to come to the point of joining and deciding to start the conversion process. I told Rabbi Ahuva that I plan to take a full year before completing the ritual of conversion. This year for me will begin after I preach my final sermon on Christmas Day which also corresponds to the first full day of Hanukkah. One unique part of my journey is that while I am choosing to be Jewish, my family is not. So a part of this year will be figuring out how to observe the holidays and Shabbat in the context of a family that is not. 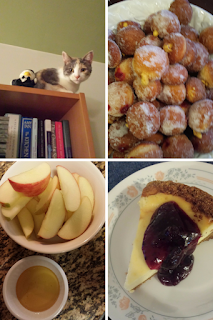 We have agreed as a family that there are things we will do together like celebrate Hanukkah by lighting the candles and enjoying latkes and hopefully make sufganiyah (fried jelly filled donuts) and Donna loves the festival of Shavuot because it means I will make cheesecake.